An interview with Grand Secretary Jerry W. Kopp. He discusses: The History of Freemasonry by Otto Klotz in 1868, March 15 and the ideal freemason, and “Entered Apprentice,” “Fellow of the Craft,” and “Master Mason,” and those higher in the organizational structure of authority, power, and influence; Grand Secretary of The Grand Lodge of Alberta Ancient, Free & Accepted Masons duties and responsibilities; other core positions in freemason lodges in Canada; the purpose for the structural and membership hierarchies for the freemasons; and Grand Master Message from MW Bro. Chris Batty, the Grand Master of Alberta, and the solutions to the three problems, identical to Batty’s, proposed by the Premier Grand Lodge in 1717 for individuals and collectives. Keywords: Chris Batty, Entered Apprentice, Fellow of the Craft, freemason, freemasonry, Grand Master, Grand Secretary, Jerry W. Kopp, Master Mason, Otto Klotz, Premier Grand Lodge. First of all, we, as individuals, should be living again by God’s principles, and doing all of this Brotherly Love, Relief and Truth, without having to brag about, to bring attention to “hey look what good I’ve done, we just do it without the fanfare. And if somebody happens to notice us, that’s good and we will get noticed for what we stand for. But we do not try to bring attention to ourselves as to what we’re doing. And that’s the way our upper echelon in Freemasonry should also act. They’re not superior to anybody. Everybody’s on the same level. They should practise that, and there is no superiority. If I was to be present with, say King Hussein, who may well be, may have been a Mason, in other words, him and I would talk on the same level, Brother to Brother. There would be no airs on. He may well be the King of Jordan, but we still talk on a level and treat each other with the same respect and so on. 10. 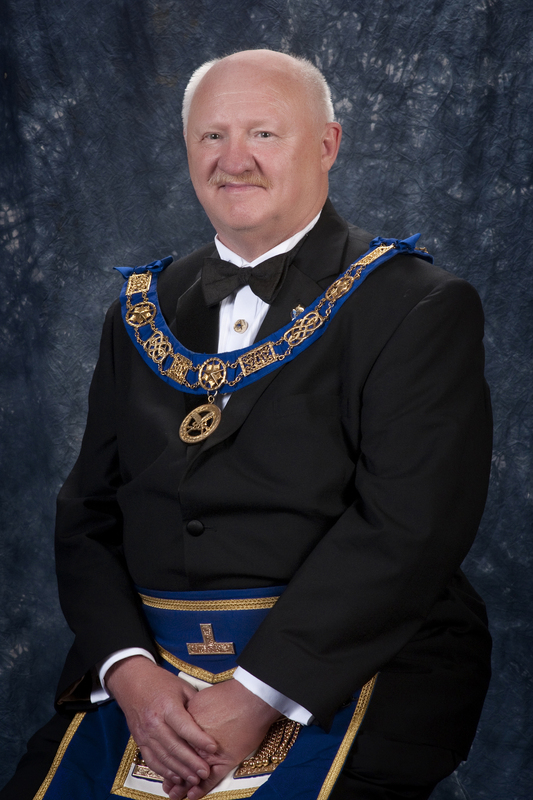 You earned the position of Grand Secretary of The Grand Lodge of Alberta Ancient, Free & Accepted Masons. What general duties and responsibilities come with this station? Oh my gosh, first of all, I’m the administrator for the organization here in Alberta. Each province has a Grand Lodge. So each Grand Lodge has a Grand Secretary. I’m here to monitor all of the Lodges that we have to ensure that they follow the Constitution and Regulations, and their own by-laws. And if there is something that goes askew, I remind them that their by-laws state that they’re not able to do this. And so I set them straight. I offer any interpretations of the Constitution and Regulations and maybe some of the ritual work that we do, my responsibilities are that, exactly that. But my further responsibilities in the Grand Lodge is that each of the Lodges pays a per capita, and we also receive monies for charities. I monitor two big charity funds, which are registered charities. And I look after, in the neighbourhood of 3.5 – 4 million dollars, which we put out for education, for children in need or students in need. It sounds like we have lots of money, but we have money that’s tied in what is called bereavement or trust funds. It is willed to us by families. That money has to be invested and it stays invested and the only money that can be extracted off that investment is the monies that we gain through interest and we disperse that through university bursaries in the neighbourhood of $5000 per student for 40 -45 students with a total amount of $220,000 per year. Our main focus is to look after those students in need. A family that makes $300,000 a year is not in need. The one thing that I noticed that there are a lot of single parents out there, single mothers that have two or three children to support. Very intelligent children with the mom’s income of $35,000 to $40,000, she can’t afford to send them to university. So this is where the Masonic Higher Education Bursary comes in. When the child intends to go to university he/she submits his/her application and the application is considered, and we review anywhere between 200 – 400 applicants and find suitable candidates which is about 40 – 45 students receive $5,000 each. 11. In terms of their titles and functions, what other core positions exist in freemason lodges in Canada? I guest the Grand Treasurer is a core person. A core position probably could mean the Grand Master, Deputy Grand Master and the Wardens, and then you have different committees and different boards. And it varies from jurisdiction to jurisdictions. Some jurisdiction might have a Board of General Purposes or a Board of Directors or they may even be where just the principal officers of the Grand Lodge are the Board of Directors. It is complicated from one jurisdiction to another. 12. Freemasonic collectives divide in lodges, districts, and halls. Ranks exist among the earliest to the lattermost membership of the freemasons too. What purpose do these structural and membership hierarchies serve for the freemasons? Well, how can I put this, it’s probably much the same as the hierarchy in the RCMP. Let’s use the RCMP for instance, they have detachments. In the detachment they have a commander. If the detachment is big enough, they may have commanders that are under the commander. They might be shift supervisors who report to a commander. Freemasonry is much the same thing, each Lodge has its Master of the Lodge. They have a Secretary and they have a Treasurer and they have several other positions. Once you get to be the Master, you are what they call a Worshipful Master, a Worshipful Brother. You are always a Brother no matter what, okay? But it is a title while you hold that position and you can carry the Worshipful title on after you are out of office. Then we go to the District Level, in the province of Alberta we are divided into fourteen districts. There are districts as small as having only four Lodges and we have other districts that have as many as fourteen Lodges within a District. Each District as a District Deputy Grand Master that oversees that district on behalf of the commander for Freemasonry in Alberta, who is the Grand Master. Of course, the Grand Master has a Deputy Grand Master underneath him, much the same as a Police Chief who has a Deputy Chief of Police. The District Deputy Grand Master helps clarify points for the Lodges within that District, much like I do as the Grand Secretary. “The greatest fear we have is to stand and speak in public. The greatest challenge in the work place is the people problems. What solutions does freemasonry propose for these problems for individuals and collectives (lodges, districts, and halls, and their respective societies such as Canada)? It’s applying God’s principles, in many respects, and as many of us know, God’s word can be twisted around by people. That’s one of the greatest challenges. I used to manage people, there are people who have problems with directives, not all directives, but some directives. Standard directives that are not followed, that’s a people problem when not followed. As a matter of fact, those that have joined Freemasonry sometime become very good speakers and may never have spoken in front of crowd prior to joining Freemasonry that is the confidence builder within the organization. For instance, myself 35 – 40 years ago, I was afraid to stand up in front of classroom, now I can stand in front of a stadium filled with 18,000 people if I have to, that’s type of confidence it has given me. With respect to marriage, I guess I’m a poor one to talk because I am divorced (Laughter). But I think that the ability to effectively communicate with each other is a breakdown in many, many marriages – failing to communicate. And we emphasize in Freemasonry the need to communicate and continue to communicate. First publication on November 8, 2015 at www.in-sightjournal.com. Please see The Grand Lodge of Alberta Ancient, Free & Accepted Masons. (2015). The Grand Lodge of Alberta Ancient, Free & Accepted Masons. Retrieved from http://www.freemasons.ab.ca/. Please see The Grand Lodge of Alberta Ancient, Free & Accepted Masons. (2015). What is Freemasonry?. Retrieved from http://www.freemasons.ab.ca/freemasonry.html. “Becoming a Freemason does not give you any particular power, or the ability to understand the secrets of the universe, but it does provide a set of principles and doctrines, and the environment where a man can practice important life skills. Freemasonry embraces men of all religions and faiths. We do not discuss religion or politics in any of our meetings. We must understand that the tenets and principles of Freemasonry are not aligned to everyone. It is, therefore paramount that we ensure that men who come to our doors are doing so for the right reasons. Please see The Grand Lodge of Alberta Ancient, Free & Accepted Masons. (2015). Grand Master Message. Retrieved from http://www.freemasons.ab.ca/gm_message.html. “It would be a sad occasion, even today, if the Grand Lodge of Alberta did not receive at its Annual Communication a delegation from its Mother Grand Lodge. History rolls on and political changes do come. It now became expedient to divide the huge North West Territories into smaller political sections. Thus the Government of Canada on the first day of September 1905 carved out two new provinces, Saskatchewan and Alberta. Alberta must now separate itself from the Grand Lodge of Manitoba and separate they did. Five months following the Constitution of the Grand Lodge of Alberta the First Annual Communication was held in Medicine Hat on February 20, 1906. At this meeting R.W. Bro. Oswald Kealy was elected and installed as Grand Master. Please see The Grand Lodge of Alberta Ancient, Free & Accepted Masons. (2015). History. Retrieved from http://www.freemasons.ab.ca/history.html. Please see The Grand Lodge of Alberta Ancient, Free & Accepted Masons. (2015). Lodges & Districts. Retrieved from http://www.freemasons.ab.ca/districts_lodges.html. American Medical Association (AMA): Kopp J. and Jacobsen S. An Interview with Grand Secretary Jerry W. Kopp (Part Two). In-Sight: Independent Interview-Based Journal [Online]. November 2015; 9(A). Available from: https://in-sightjournal.com/2015/11/08/an-interview-with-grand-secretary-jerry-w-kopp-part-two/. American Psychological Association (APA, 6th Edition, 2010): Kopp, J. & Jacobsen, S.D. (2015, November 8). An Interview with Grand Secretary Jerry W. Kopp (Part Two). Retrieved from https://in-sightjournal.com/2015/11/08/an-interview-with-grand-secretary-jerry-w-kopp-part-two/. Brazilian National Standards (ABNT): KOPP, J. & JACOBSEN, S. An Interview with Grand Secretary Jerry W. Kopp (Part Two). In-Sight: Independent Interview-Based Journal. 9.A, November. 2015. <https://in-sightjournal.com/2015/11/08/an-interview-with-grand-secretary-jerry-w-kopp-part-two/>. Chicago/Turabian, Author-Date (16th Edition): Kopp, Jerry & Jacobsen, Scott. 2015. “An Interview with Grand Secretary Jerry W. Kopp (Part Two).” In-Sight: Independent Interview-Based Journal. 9.A. https://in-sightjournal.com/2015/11/08/an-interview-with-grand-secretary-jerry-w-kopp-part-two/. Chicago/Turabian, Humanities (16th Edition): Kopp, Jerry & Jacobsen, Scott “An Interview with Grand Secretary Jerry W. Kopp (Part Two).” In-Sight: Independent Interview-Based Journal. 9.A (November 2015). https://in-sightjournal.com/2015/11/08/an-interview-with-grand-secretary-jerry-w-kopp-part-two/. Harvard: Kopp, J. & Jacobsen, S. 2015, ‘An Interview with Grand Secretary Jerry W. Kopp (Part Two)’, In-Sight: Independent Interview-Based Journal, vol. 9.A. Available from: <https://in-sightjournal.com/2015/11/08/an-interview-with-grand-secretary-jerry-w-kopp-part-two/>. Harvard, Australian: Kopp, J. and Jacobsen, S. 2015, ‘An Interview with Grand Secretary Jerry W. Kopp (Part Two)’, In-Sight: Independent Interview-Based Journal, vol. 9.A., https://in-sightjournal.com/2015/11/08/an-interview-with-grand-secretary-jerry-w-kopp-part-two/. Modern Language Association (MLA, 7th Edition, 2009): Kopp, Jerry, and Scott D. Jacobsen. “An Interview with Grand Secretary Jerry W. Kopp (Part Two).” In-Sight: Independent Interview-Based Journal 9.A (2015):November. 2015. Web. <https://in-sightjournal.com/2015/11/08/an-interview-with-grand-secretary-jerry-w-kopp-part-two/>. Vancouver/ICMJE: Kopp J. and Jacobsen S. An Interview with Grand Secretary Jerry W. Kopp (Part Two) [Internet]. (2015, November); 9(A). Available from: https://in-sightjournal.com/2015/11/08/an-interview-with-grand-secretary-jerry-w-kopp-part-two/.